Today the Papertrey Ink team has some butterfly inspiration for you! We have some new butterfly products coming out on the 15th! Let's get started! My first card is a little bit on the artistic for me, but I had fun making it! I used the new Background Basics: Splats stamps in the background and a new Cover Plate: Butterfly die over the top. I cut the top piece out of watercolor paper and just went to town with yellow, orange and red watercolors. It's kind of messy, but just a fun look to try! 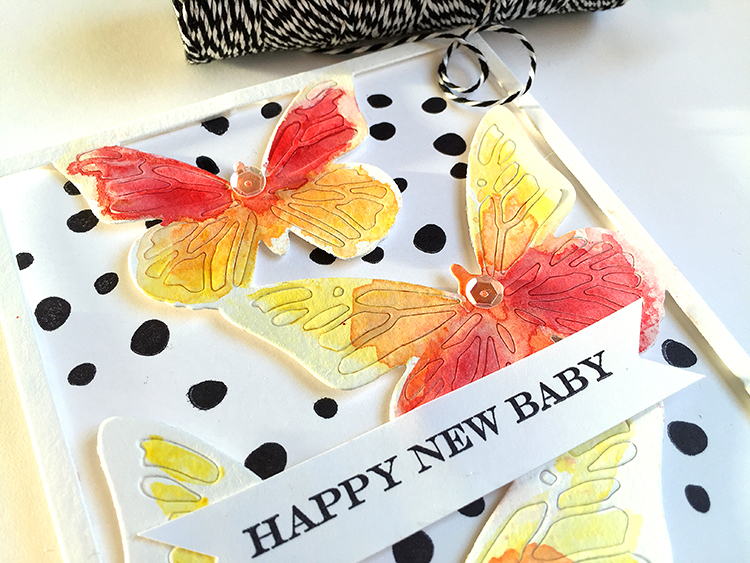 "Happy New Baby" was stamped with Keep It Simple: Baby stamps. The whole front is popped up with pop dots. 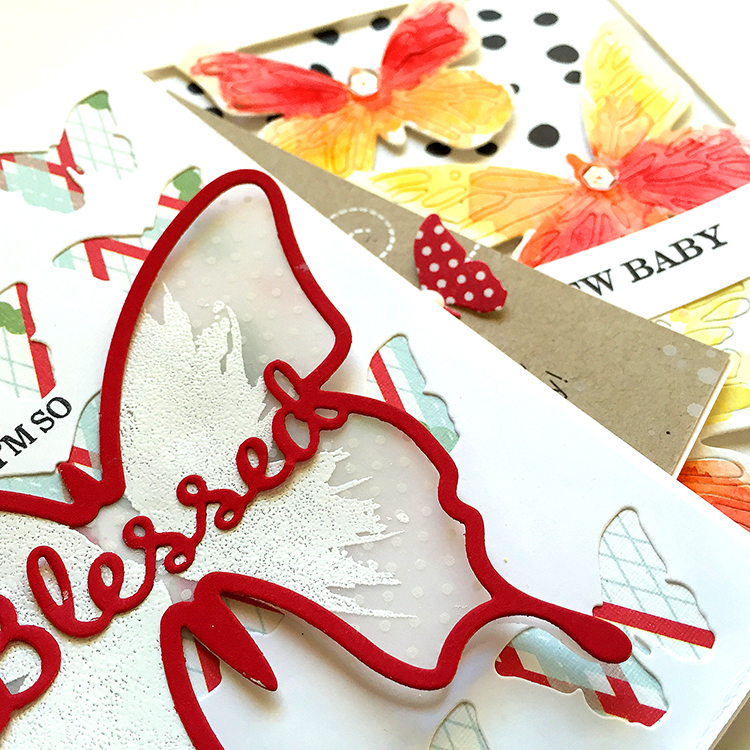 Next is a card made with a new die called the new Bitty Butterflies die. It's an A2 size that cuts out all of the small butterflies. I used the negative sheet and backed it with a Holiday Plaid paper. 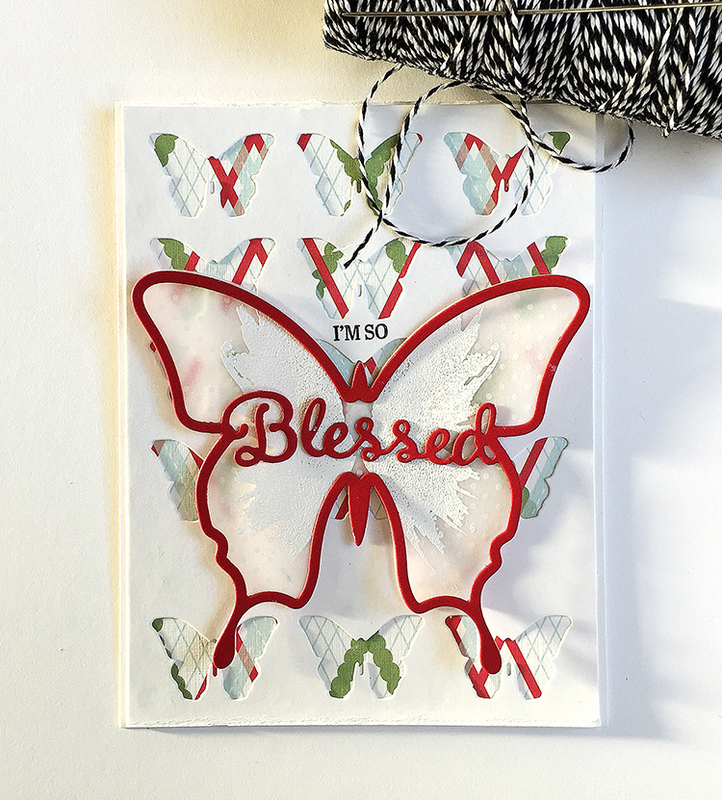 Then I used the new Enclosed: Butterfly dies and stamps to create the large butterfly, backed with vellum that I stamped with Enclosed: Butterfly stamps. What do you think of the white with the red? Last is a card that totally happened by accident, I actually had the card all finished, then took it apart after I had the idea to add the vellum first, then the small butterflies. I really like the layers! All of the butterflies are cut out with the same die from the last card, the Bitty Butterflies die. I love how you can cut so many of them at once. Then they are stamped with the Bitty Butterflies stamps! 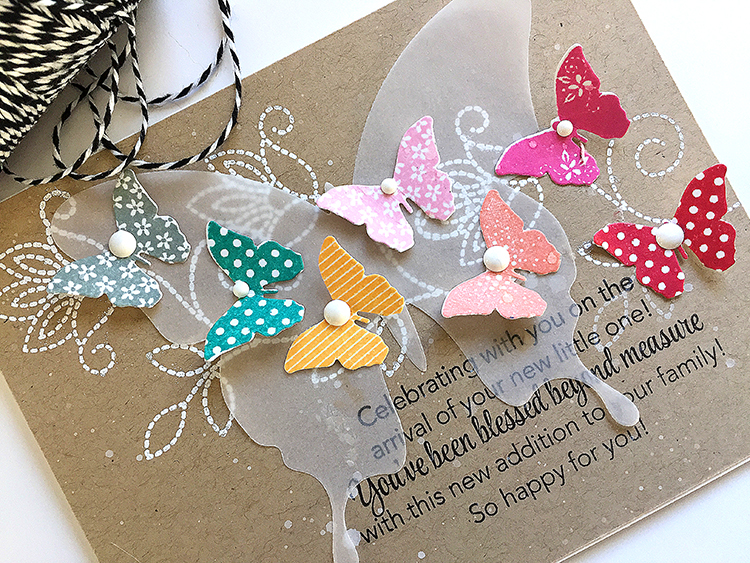 First, I stamped the sentiment and wanted the smaller butterflies to flow up the card, so I figured out the placement of them around the sentiment. Then I stamped the Stitches & Swirls above the sentiment and embossed them in white to make them pop a bit more. I added the stamped butterflies, enamel dots and a bit of white paint splatters. OTHER: white embossing powder, enamel dots. All of the new products you see here today will be available at Papertrey Ink on the 15th at 10pm EST! Thank you for stopping by! Visit the rest of the team to see more butterfly inspiration! All lovely, but your "artistic" card makes my heart beat faster. LOVE that BG. Beautiful cards, Danielle. I love the red and white - that's so "you"! And the last card is fantastic! I always love all the 'little touches' you put on cards - they add so much to them and make them works of art! Butterflies on kraft is really, really cute. Beautiful cards, Danielle! I need that new coverplate! These are all so gorgeous, Danielle, the butterfly dies are really impressive!! Fabulous work, Danielle! I love that you used vellum for your red and white butterfly (gorgeous) and your last one on Kraft is definitely frame-worthy. So perfect with that vellum added. Do I need the background splats??? Love them all Danielle!!!! The vellum is so pretty! Love these to bits!! I adore the red with white on butterfly! 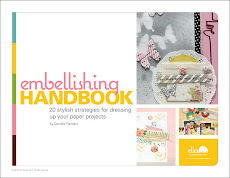 And the vellum addition for the last project is gorgeous! 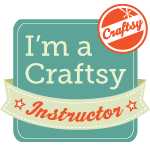 I am always looking forward to your blogposts and this post made me sigh...:) So lovely! The third card is my favorite. 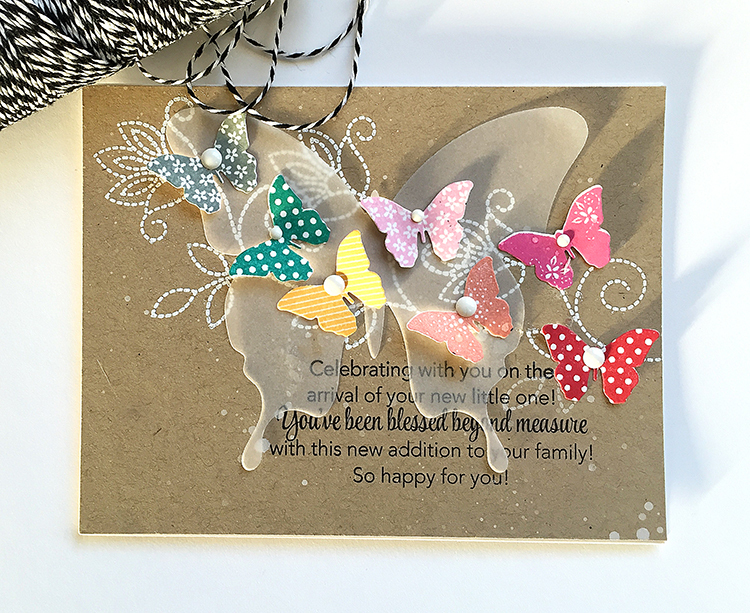 The butterflies are almost dancing on this card and the stitched swirl is a stunning detail! Love how you used the pattern paper. Your style always brings spring into a room! Lovely, Danielle! Beautiful. 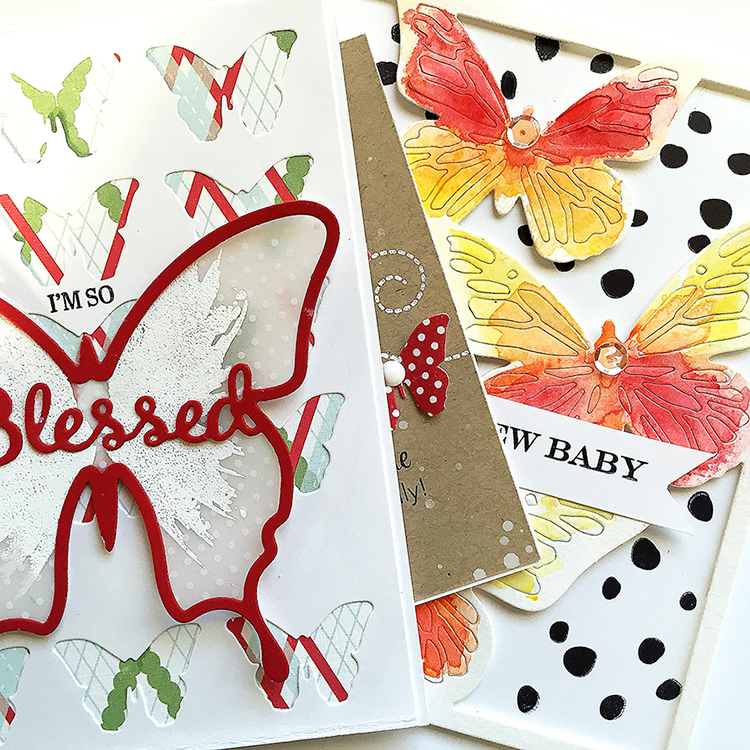 Love all the new butterfly dies. Beautiful designs. Love all the butterfly designs. Awe, the white embossing on vellum with red is simply divine. Each card is a work of art and all so different. 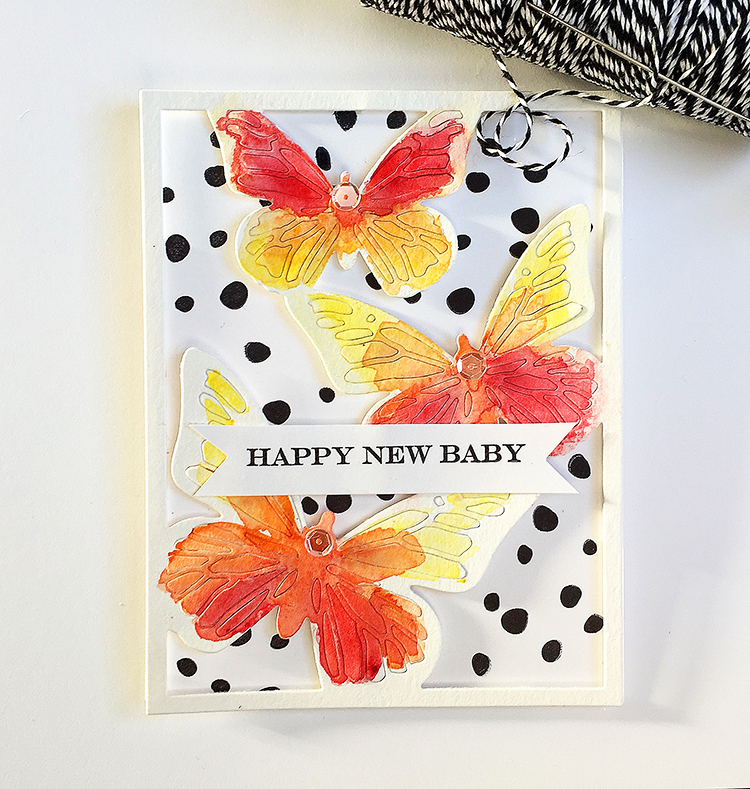 Your colorful fluttering butterflies on Kraft is not your typical style but I love it. Totally inspired, Danielle!